Buy, sale, or trade your unwanted stuff here. PLEASE READ THE INSTRUCTIONS/INFORMATION BEFORE POSTING. Up for sale is my daughter’s 94 LX. Exterior paint is oxidized original (green), no rust, no wrecks. 245,000 miles on it. Runs, but engine and auto-trans are showing their age. I sold it to a guy for $1000 6 months ago, he was planning to do a 5sp swap and H23bluetop but then found out he has a baby in the way. 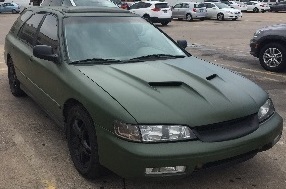 He’s asking $500 for it now, just needs it gone to get some family money. Anyway, i work with this guy and title is still in my name so i told him I’d list it up here and see if anyone wants a purty LX for parts or to restore. If i had somewhere to store it i would just buy it back! As far as parts, it’s got new brakes (drums in rear), good tires, new hubs, new half-shaft axles, EX 7-spoke alloy wheels, OEM driving lights, roof rack i adapted from a CRV, new struts all around, all body panels straight, good complete interior (tan), tinted windows, solid hatch, bumpers both good... we had the car for 6 years and kept everting up, putting ~20k miles a year on it, mostly freeway.